Provide bats their choice of housing with the BestNest Double Bat House Kit. Offering bats safe roosting spots helps them maintain their population levels, and this unique, dual house system is fantastic for sheltering up to 500 bats. 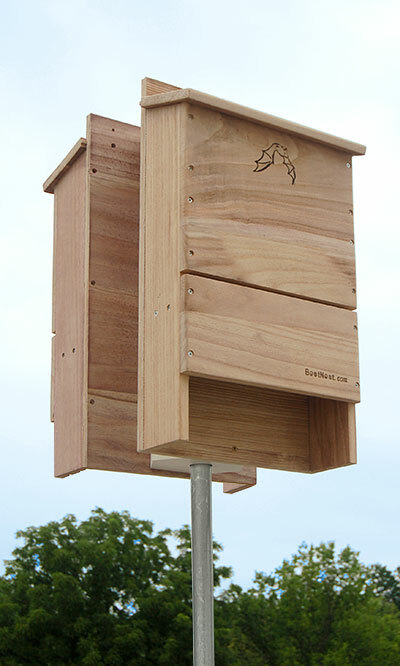 The two BestNest Triple-Celled Bat Houses have been meticulously designed for efficiency, with deep grooves on each reinforced landing pad and throughout the interior of the unit. This creates plenty of clinging surface for the bats, and the chambers each measure 1" deep. The slanted roof on each home keeps rain away from the interior, while a 0.25" wide ventilation slot aids in regulating the internal temperature. Secure the top lip of each house to the included Hexagonal Bat House Pole Adapter, and insert its flange into the top of the included Heath Martin House Pole for fantastic placement. The adapter's lower bracket keeps the base of each house from hitting the pole, and its PVC body lasts for many seasons. Once the homes have been mounted to the poles, read the included Stokes Beginner's Guide to Bats book for a thorough understanding of your new colony. Offer beneficial bats several roosting options in your backyard with this Double Bat House Kit.